Remember when the Oculus Rift preorders opened up at a whopping $599, and gamers revolted? Remember how we optimistically wished, “now we’ll wait and see whether the HTC Vive...is more affordable?” Well, it’s not. 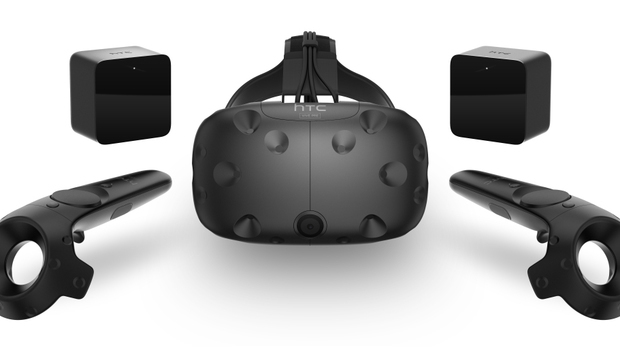 Starting February 29, you’ll be able to preorder the HTC Vive from htcvive.com (Steam will point to HTC’s order page). Your VR kit, assuming you get in on the first batch, will ship in early April (the exact date has not yet been announced). So what do you get for a VR kit that costs $200 more than the already-expensive Rift? In the box, you’ll find the head-mounted display with integrated camera, the two wireless base stations, the break-out box you plug everything into, and most importantly, two wireless VR controllers. It’s the precise motion- and position-tracked controllers, together with the ability to be tracked as you walk around the room, that really separates the Vive from the Oculus Rift. HTC and Valve are quick to point out that, yes, this is expensive, but it’s the only complete VR experience. The final shipping headset is tweaked and improved over the “Vive Pre” we saw at CES. It looks almost identical, but features better ergonomics (including an improved strap and a pair of swappable “gaskets” to rest against your face—one narrow and one wide), and a built-in microphone. You’ll even be able to connect your phone to the Vive and receive calls, texts, and notifications without taking off the headset. And because hardware is nothing without software, the kit will come bundled with two games: Fantastic Contraption and Job Simulator. Though there is something to be said for developers being able to make experiences knowing that all users have VR controllers, it’s not hard to see a parallel between the Xbox One and PlayStation 4 here. Microsoft originally sold the Xbox One at a steeper price than its rival, arguing that the Kinect you were forced to buy was integral to the experience and that it didn’t want to divide the developer community. While that parallel springs immediately to mind, it may not be apt here: The ability to manipulate objects with your hands in a natural way is central to the VR experience in a way Kinect is not for Xbox games.